Flagellation, or whipping, was very common in Rome. It was still in use during the Middle Ages most notoriously in the army where flagellation was a very common form of punishment. The British army was very notorious for using flagellation to punish minor offenses. The amount of whipping depended on the victim's crime and it sometimes incurred death. Many towns had a post in the main plaza for the sole objective of displaying public whippings. Deserters, thieves and traitors were common victims to this torture method. In the High Middle Ages, flagellation became less common due to newer torture methods. Some authors call whipping "half death" because the amount of people who died from it, caused by an infection, lack of blood or damage to an organ, was a very significant percentage. The whipping generally occurred against the victim's back, but when a more severe crime was committed his chest could be whipped, which was especially dangerous and painful. There were different types of whips. Some had small metal spikes at the end to inflict more pain. These whips could cause some serious trauma including teared skin, eye damage and even the loss of a vital organ. 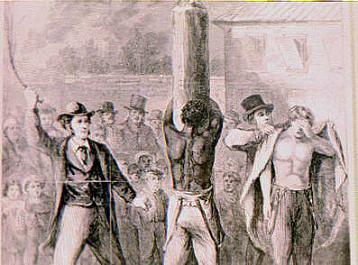 Flagellation was greatly associated with slavery. Most masters had a whip at hand in order to punish disobedience. The act of whipping continued well into the past century and reached its peak during the Roman Times. Medieval lords were also especially fond of using this torture method. Some countries still whip as a form of punishment in recent times.